to have conspired with other devious GBC leaders to poison Srila Prabhupada to death. "The expression and symptoms of the face, the eyes and the manner of speaking indicate to me that Srila Prabhupada was poisoned, most probably by arsenic or mercury. He Himself said that He was poisoned, confirmed by dullness of the face and how the natural color of the body is gone. This is very hard for the average person to understand; only the experienced eye can tell." "So as Krishna was attempted to be killed... And Lord Jesus Christ was killed. "my only request is , that at the last stage don't torture me, and put me to death"
Tamal Krsna: Prabhupada was thinking that someone had poisoned him. Bhakticaru: Someone gave him poison here. Bhakticaru: He said that when Srila Prabhupada was saying that (he is poisoned) there must be something truth behind it. 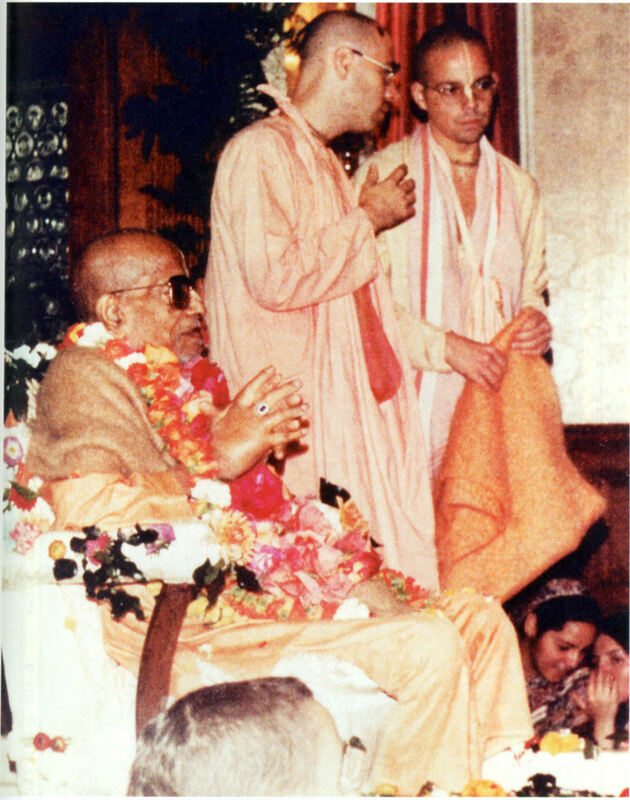 Srila Prabhupada's own words, stating that his poisoning is possible, is the strongest possible evidence, since these are the words of the acharya. Such directly revealed evidence is conclusive since it is beyond the four defects. Even supposedly water-tight forensic evidence has to take second place to the words of the acharya. Any sincere disciple of Srila Prabhupada will believe in His words. Tamala Krsna: Put poison in different containers. That's all right. This is not a whisper - these words are clearly audible, spoken by Tamal Krsna. It is interesting to note that even though the transcription of this section of the audio tape was transcribed into the BBT Folio, this sentence was omitted. Why was this sentence omitted? How will BBT / Bhaktivedanta Archives officials explain this mystery? Tamal Krsna, Bhakticaru, Jayapataka and Bhavananda were obviously dominating over the conversations at the time. Srila Prabhupada was 80 years of age, his body was skin and bones, he could hardly speak. On the other hand Tamal Krsna, Jayapataka, Bhavananda, Jayadvaita, Bhakti Charu, Giriraj were about 30 years of age. To solicit such a response from their own spiritual master to not torture him and ‘put to death’ is nerve racking to say the least. Their behavior is typical of people with a psychopathic nature and demoniac consciousness. Srila Prabhupada left this mortal world on November 14, 1977. But He lives forever in His instructions, and His followers will always live with Him. While thou art living still in sound! 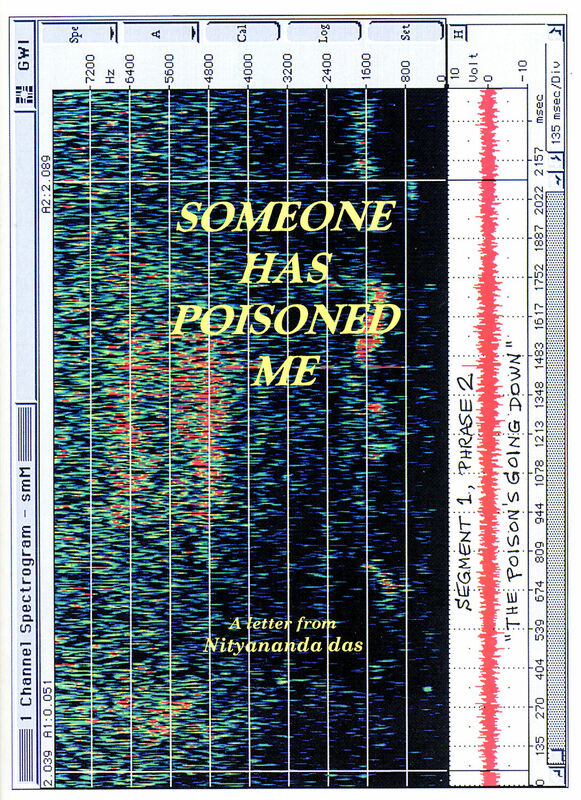 To spread the Holy Name around"
SRILA PRABHUPADA CONFIRMS POISON WHISPERS! 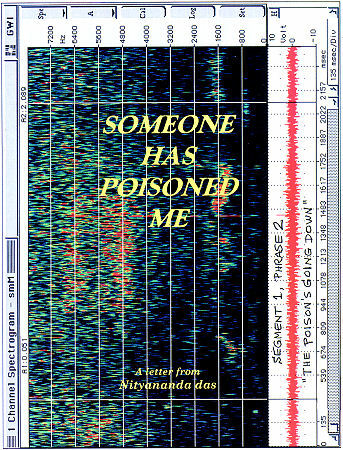 Tamal Krishna to Srila Prabhupada: "Now you have to choose which suicide"
Disappearance Day Overshadowed By "Poison Tapes"
01/05/98-1467 Can Pure Devotees Be Killed? 12/23/97-1419 A Known Criminal Supplied "Makaradhvaja"
12/22/97-1415 Ravindra's 'Enemies of ISKCON'? 12/03/97-1306 Why Poison Srila Prabhupada? 12/01/97-1303 "Better Kill Me Here"
11/29/97-1295 "Poison Has Been Given"
11/27/97-1284 Re: "Poison Ishvara Rasa"
11/14/97-1206 Perle Lab to Analyse "Poison Tapes"
11/11/97-1196 Incriminating Whisper Found On "Poison Tapes"